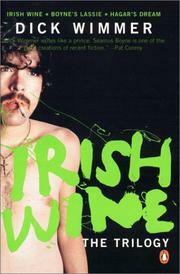 A comic trilogy that tacks one new episode onto two reruns, Wimmer’s collection—Irish Wine (1988), Boyne’s Lassie (1998), and Hagar’s Dream—follows the misadventures of wild-man Seamus Boyne (Irish scourge of the British art world) and his timid friend Gene Hagar (a Long Island exterminator with literary ambitions). Boyne, like most bohemians, is always one step or two from utter ruin but never goes completely over the edge—sometimes suicidal (from both his failures and his successes), he has faced the wrath of assassins, faked his own death, rescued his daughter from kidnappers, saved his paintings from a burning gallery, impersonated monks, and stolen girls from his best friend. That friend, of course, is the hapless Hagar, who toils glamorlessly by day in his pest-control business but still finds the time to hop the Atlantic now and then to get Boyne out of some of his messier scrapes—although, in the end, he manages a weird kind of sexual revenge when he steals the heart of Boyne’s beautiful daughter Tory. The usual gathering of odd ducks and charming layabouts wander onstage throughout, keeping the pace up whenever the story begins to lag. Good pointless fun, in the tradition of Joyce Cary’s The Horse’s Mouth and every other bohemian romp you’ve ever read.